iTunes 10 is an audio player for playing and organizing digital music files. iTunes can connect to the iTunes Store to purchase and download music, music videos, television shows, iPod Games, Audiobooks, Podcasts, movies and movie rentals (not available in all countries), and Ringtones (only available on iPhone and iPod Touch 4th Generation). It is also used to download Apps from the App Store for the iPhone, iPod Touch and iPad. 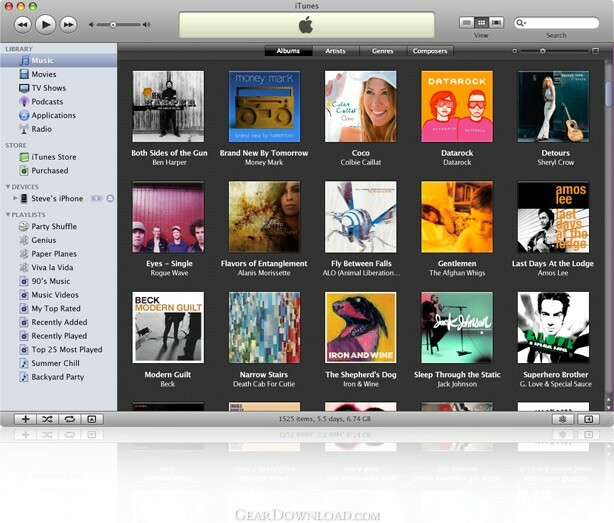 iTunes 10 is an audio player for playing and organizing digital music files. ...... Internet through its built-in music store, run a visualizer to display graphical effects in time to the music as well as encode music into a number of different audio formats. iTunes 10 includes the Quicktime Player installer. iTunes 10 includes visualizers. Shown here is a visualizer first delivered with iTunes 8, including black orbs and moving specks of light.iTunes is an application that allows the user to purchase and manage audio and video on a personal computer, acting as a front end for Apple's QuickTime media player. Backup your iPod/iPhone music/video/playlist/photos to Mac and iTunes. Qweas is providing links to iTunes 10 10.6 2012 as a courtesy, and makes no representations regarding iTunes 10 or any other applications or any information related thereto. Any questions, complaints or claims regarding this application iTunes 10 10.6 2012 must be directed to the appropriate software vendor. You may click the publisher link of iTunes 10 on the top of this page to get more details about the vendor.